Vivien Killilea / Stringer / Getty ImagesBlake Mycoskie attends TOMS’ Austin Store Opening in March 2014 in Austin, Texas. Today, dozens of other companies have followed in TOMS’ footsteps with one-for-one models. TOMS has given away over 60 million pairs of shoes, and they have expanded into bags, eyewear, and coffee. Blake Mycoskie: It’s something that we’ve thought a lot about. It’s our 10-year anniversary this year. One thing that I think has become really clear is we didn’t start a company with a mission, but we had a mission that turned into a company. And I think that’s a really important distinction because I started TOMS basically to fund the giving that I wanted to do to the children I met in South America. I didn’t want to start a charity to be dependent on donations. A lot of people now call it social enterprise, conscious capitalism, and there’s a lot of labels for what we are. But I think the phrase that “we are a mission with a company” is probably the best way to describe it as opposed to a company that has a mission. Lebowitz: Why did you step down from the position of CEO and what’s your current role at the company? 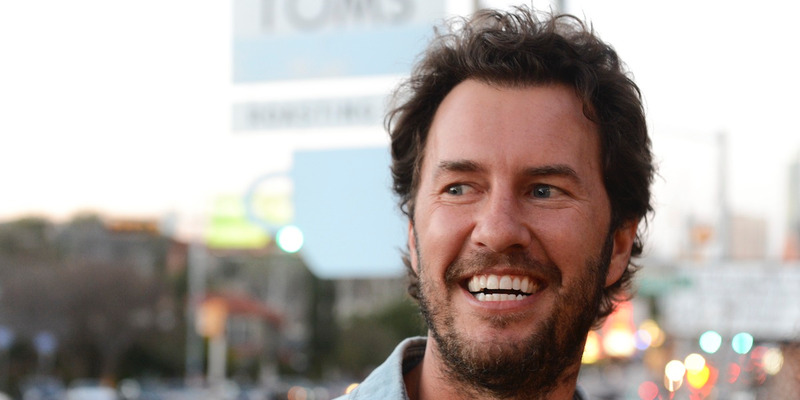 Mycoskie: I was CEO by default, but I never was a CEO. I mean I’m a founder, I love the beginning of things. I love working with the creative team, but running a business, dealing a lot with HR, dealing a lot with processes, that’s never really been my strength. Once I was in a position where I could bring on and attract world-class CEO talent, like Jim, our CEO, I was super excited to do so. Success in business is about playing to your strengths as a company and as individuals. And my strengths are definitely in telling our stories, getting people excited about our mission, working with the marketing and creative teams to create the product and the messages we want to share, and now I can focus all of my time on that because now I don’t have the responsibilities of being a CEO. So it’s a really great partnership with Jim, business has never been stronger, and our employees are a lot happier, too because they have someone day-to-day that they can go to. 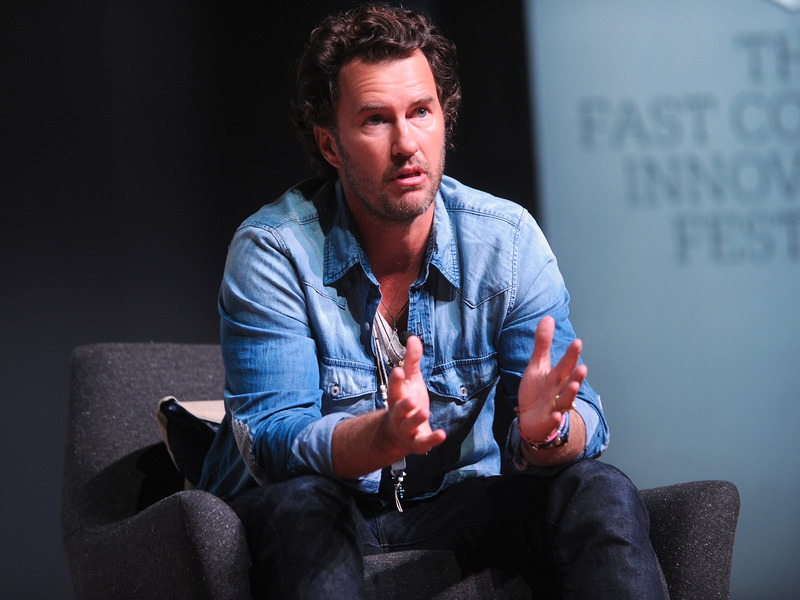 Getty Images/Brad BarketBlake Mycoskie speaks at the Fast Company Innovation Festival in November 2015. Mycoskie: That decision was always kind of a necessary one in order to attract a great CEO. When the company is 100% owned by the founder — no investors, no board — it’s very hard to attract amazing executive talent because the founder could wake up one day and be like, “I don’t like your shirt colour; I want you to change.” And that’s a real risk to an executive. By having a 50/50 partner I was able to create that security and stability that would attract world-class talent. The other thing is our business is growing a lot, in different new ways. The global expansion is one of our biggest focus areas. We’re getting into all different types of shoes, not just the main shoe that we originally started with. There’s a lot of complexities around supply chain, retail growth. We were entering a phase where there were a lot of new challenges that frankly, I never dealt with. Mycoskie: I think it’s incredibly sustainable. Built into our cost structure is the intention to provide great benefit to our customers because they feel like they’re getting to be part of something more than just a transaction. More and more understand what the impact of their purchases are on the rest of the world. By doing that, we’re able to form more loyal customers; we’re attracting new customers. While we spend a ton of money on giving, we also feel that there’s a real return on that investment. But then when you ask those people, when you tell them about the mission, you say, “Are you more likely to buy more products?” The answer is resoundingly yes. So one of our big challenges as a business is how do we share our story, how do we share our mission in more ways? We’re really investing a lot in telling that story more in store displays. We’ve installed virtual reality headsets in all of our stores so people can go on a virtual giving trip and see the children that they’re helping in countries like Peru, in Colombia. That’s one of our big areas of focus right now, is telling our story more, not taking it for granted that people already know it. Mycoskie: I love it. I think it’s a testimony to the influence that we’re having on business. My goal is very simple for TOMS. I want to build the most inspirational and influential company in the world. 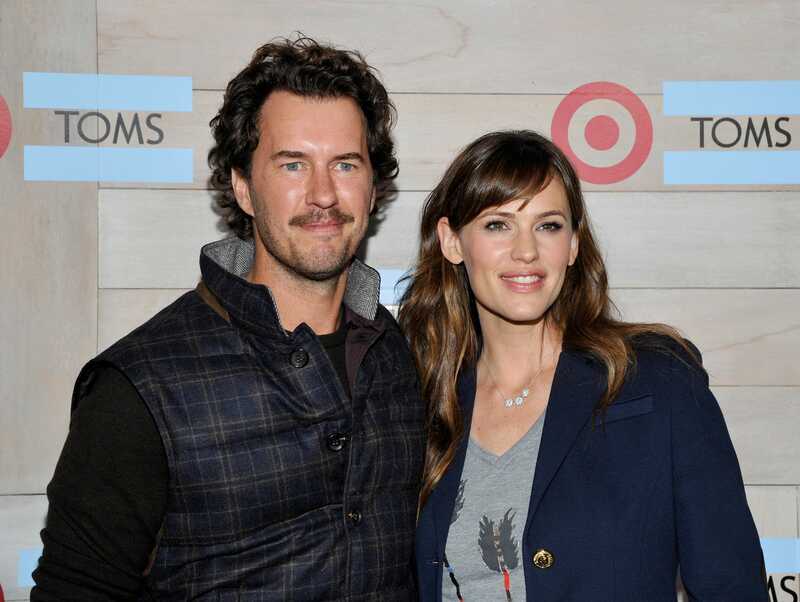 John Sciulli/GettyBlake Mycoskie and Jennifer Garner attend the TOMS for Target in November 2014 in Culver City, California. Mycoskie: If you look at the majority of entrepreneurship, it’s really happening for people in their 20s, before they have families and all different types of responsibilities. They’re able to take more risks in their 20s. That is also the demographic that wants to make purchases that count more, wants to make purchases that are conscious. So it’s not surprising that the same patterns and changes in consumer behaviour is being seen in the types of companies that these entrepreneurs are creating. That’s also one of the reasons why I’m investing heavily into social entrepreneurs of the future, because I want to make sure that the movement that we have helped has long-term sustainability. And that more and more companies are getting funded and getting an opportunity to become the next TOMS. Mycoskie: We always look first at: Is the company’s purpose and mission in the DNA of the product or service or company? It can’t be something that they’re adding on. It has to be the reason they exist. 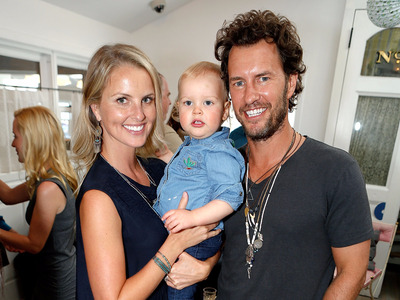 Randy Shropshire/GettyBlake Mycoskie, wife Heather, and son Summit at the partnership celebration between TOMS and Oceana in March 2016. Mycoskie: I’m an entrepreneur. I started my first company at 19; I started five companies before TOMS. I love using business as a way to solve problems. I think that there’s a lot of important need for charity and nonprofit work in the world, but I felt like if I could use business — something I was really good at — to solve problems like kids needing shoes or people needing eye care surgeries or prescription glasses, that was a better match. Lebowitz: So you feel like you can make a bigger impact on the problems that you’re trying to solve as a business? Mycoskie: For sure, I think that’s a lot more sustainable than asking people for money. Because you can ask people for money, say once or twice, and they will support you because they believe in your mission and what you’re doing, but ultimately they might feel a need to give their charity dollars to someone else. Whereas if you create a long-term customer of your brand and every time they’re buying something they’re getting something that they want and they need, then that’s a much longer-term revenue style than just asking for money or donations. Lebowitz: Can you speak to some of the criticisms that TOMS has received — that TOMS doesn’t alleviate poverty for more than say a few months, or that the buy-one-give-one model can hurt local people who are trying to sell their shoes and their products? Mycoskie: To alleviate poverty you need education, jobs, and basic health needs. We use our shoes to protect children’s feet from foot disease; we use our shoes to help complete the school uniform where some families can’t afford the shoes for the uniform. So that’s the education piece. And then the job creation we’re trying to do more and more. Since some of that early criticism, we have responded and we moved 40% of our supply chain for giving shoes to countries that we give in. Today we make shoes in Kenya, we make shoes in India, Ethiopia, Haiti, and all of this is a way to create more jobs. But even with all those things that we’re doing, by no means is TOMS a single-stop solution to alleviation of poverty. It’s a very complex thing to take someone who is living in poverty and help them progress their life to a different economic status. In terms of the criticism towards disrupting local markets, that’s one where we 100% agree. We are incredibly diligent to make sure that our shoes are being given in very, very rural areas where families are having to choose between shoes for the uniform or food on the table, and they’re choosing food on the table. By no means do we ever want to disrupt a local market. TOMS itself does not put the shoes on people’s feet. We work with charities and nonprofits. Our giving partners, they’re all leaders of nonprofits and charities and they’re really focused on improving the quality of life in the people that they serve. So they have the utmost interest in making sure that we’re not disrupting anyone in the market. Mycoskie: Each of them has their own challenges, but we’re making millions of shoes in these countries now. We went from 0% in 2013 to now 40% of our new shoes are being made in these given countries. And we’re finding that from a business perspective, it actually financially is beneficial because we’re saving money on the cost of shipping the shoes all over the world when we can make them and give them in the same country. Michael Kovac/GettyBlake Mycoskie at the celebration of the One For One TOMS eyewear product launch in June 2011 in Santa Monica, California. Lebowitz: You’ve mentioned that you took a sabbatical a few years ago because the company at that point was more focused on process than purpose. Could you could elaborate on that? Mycoskie: As soon as you’re growing so fast, you’re having to think about hiring people who have the right résumé and right technical experience. And I think we hired a lot of great people during that time frame that had the technical experience that helped us and allowed us to scale and grow. But a lot of the people who were making big decisions for the company and technically running the business I don’t think were as aligned to our original purpose as I would have liked them to be. After taking almost a year off, I recognised I was as passionate about TOMS as I was in the early days, but we needed to make some changes, we needed to get everyone refocused back on our mission and purpose, which would also require making some executive changes as well. That’s a big part of why I partnered with Bain. Lebowitz: Since then you’ve expanded into the coffee business. Why? Coffee I felt would be a great one to do it in, because the coffee industry is going through kind of a radical transformation with all these new-wave coffee shops like Stumptown, Intelligentsia, Blue Bottle. I think we can source coffee of the same quality as them, and at the same time use coffee as a way to create more of a community in our stores, and allow TOMS to be experienced in people’s homes in a different way and our giving model to be experienced in a different way. 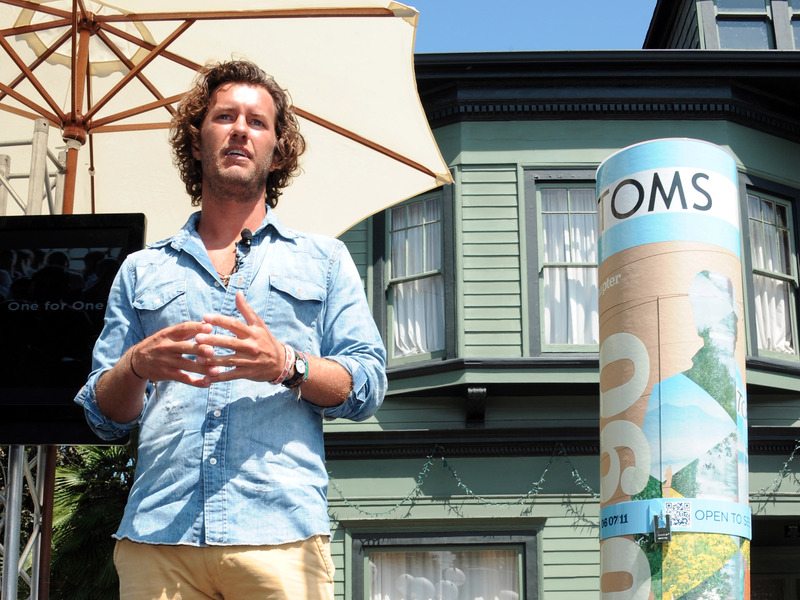 Mycoskie: It’s not only core to the business or brand, but now we have protected it forever. Part of the transaction with Bain was that even if it’s Bain or another potential partner down the road, that model will always be done. Good times or bad times, one-for-one will always be a part of Toms.